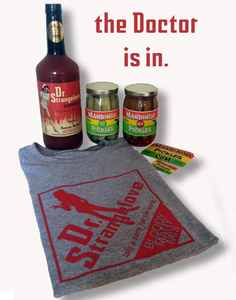 Dr. Strangelove Bloody Mary Mix is finally making house calls! Choose either Original or Hot flavor and your shirt size. A jar of MANDINGO Pickles Garlic Dill and a jar of Hot to garnish your new found love. Makes for a merry Christmas to yourself, family or coworkers/employees. Don’t worry shipping is Free! Pickles are great! Have quite the kick also. Two Saturday bloody Mary’s for me and I am hooked, shout out to Byron’s country market for carrying them. How can a guy get a Mandingo t shirt?